Today was Hari Raya Aidiladha, a public holiday in Malaysia. And my SSEAYP batchmate Kenneth invited me to join their road trip to Ipoh in the state of Perak, some 205 kilometers north of Kuala Lumpur. With so much chocolate tickling my taste buds yesterday, the food trip today was a most welcome sequel. It’s a complex mixture of several herbs and spices, about ten I was told, boiled with pork ribs for hours! They served us youtiao (strips of fried dough) which was so tasty especially when dipped in the soup. 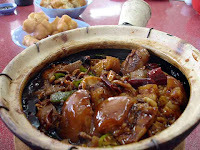 The dish which is served in a claypot had other ingredients such as mushrooms, tofu and lettuce. And it’s eaten with rice. We also tried out the dry bak kut teh which is less common but equally tasty. That is stir-fried meat with okra, dried chilies, and dark soy sauce. But the unique ingredient in this dish is dried cuttlefish. After that sumptuous breakfast, we were off. Road travel in Malaysia is very convenient since there is a complex network of highways linking peninsular Malaysia from north to south and east to west. So the drive to Ipoh, roughly the distance between Manila and Dagupan, can be completed in less than three hours. And since it was a smooth drive, I was able to cat nap. And the next thing I knew, we were already exiting at Sungkai, a small town south of Ipoh. 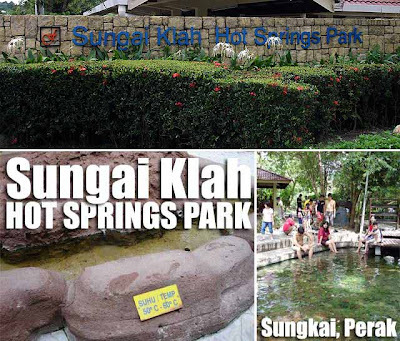 We drove several kilometers further through vast palm oil plantations before reaching our destination, the Sungai Klah Hot Springs Park, said to be one of the best managed hot springs in Malaysia. 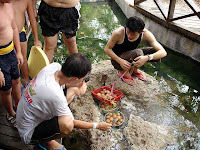 A healing center nestled at the foothills of the Titiwangsa Range, the park attracts both locals and foreigners who seek a cure to various ailments such as skin disease, rheumatism, arthritis, insomnia, respiratory troubles, and blood circulation. Being a popular destination, it gets crowded on weekends and holidays. And since we were there on a holiday, it was jam-packed with people. I was not able to pack my swimming gear since it was a business trip after all. So I was content with dipping my feet in 50° Celsius sulfuric water. The temperatures in the different pools varied and were clearly marked since areas where the hot water bubbled up from the ground can reach a scalding 102° Celsius! In fact, those areas have been designated for boiling eggs. The hot water is said to emerge from 500 areas in the complex. A boardwalk was built parallel to these boiling streams so that people could enjoy the sulfur-rich steam that seeped through the gaps in between the planks while walking along the path. I was also tempted to try out their spa which offered the traditional Ayurveda treatments. But I didn’t want to get too oily since we still had a long day ahead, so I had to pass. I actually skipped lunch since we were still full from the late breakfast we had in Klang. Although I had a cendol drink while in the park. After a few hours, we were off to Ipoh. Part 3: Mamak food rocks! Looks delicious. I like the teluk pulai one. Anyway, if you're in KL and looking for bak kut teh, read this. 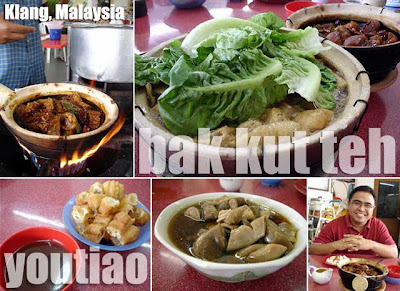 Here's a list of the 15 Top Bak Kut Teh places in KL. 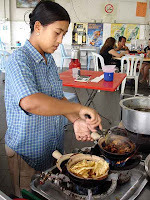 These places are some of the most popular Bak Kut Teh places in Klang Valley.